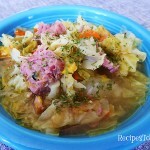 This Cabbage, Sausage and Potato Soup recipe is a hearty and comforting, soup that has the best of savoury flavours. Using the Instant Pot, you can have this on the table in less than 30 minutes. Bonus it is just as tasty the next day. Set Instant Pot to the sauté setting when the display shows hot add the oil. When the oil begins to shimmer; add the sausage to the Instant Pot. Cook for two to 3 minutes then add onion. Continue to cook a few more minutes until onion is translucent and just starting to brown in a few places. Add the garlic cook for one more minute. 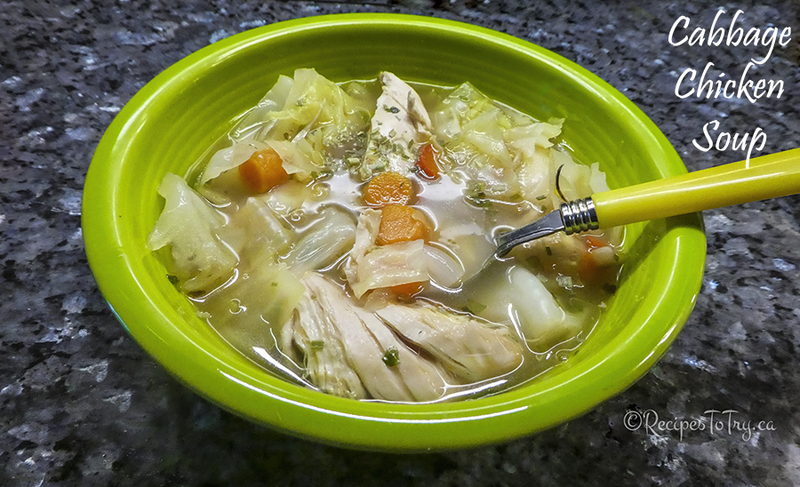 Pour in chicken broth and stir to loosen any browned bits. Close lid making sure vent is closed. 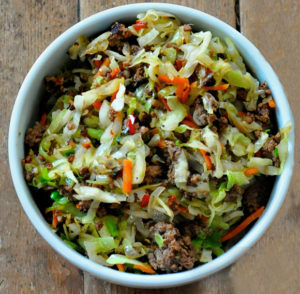 Do a Quick Release of Pressure, open lid, add chopped cabbage, carrots, sweet Pepper and stir well. Close lid, again making sure vent is closed. Cook on high 5 more minutes. Do a Quick Release of Pressure, open lid, add the fish sauce** and season to taste with freshly ground black pepper. As Fish sauce is quite salty, you may not need to add additional salt. ** Fish Sauce although can smell pungent when combined with other ingredients such as herbs’ it mellows out and adds a rich and savoury umami–richness to a dish. 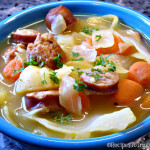 The broth is flavorful and tasty. The Soup filling and that it is very low in calories a bonus. 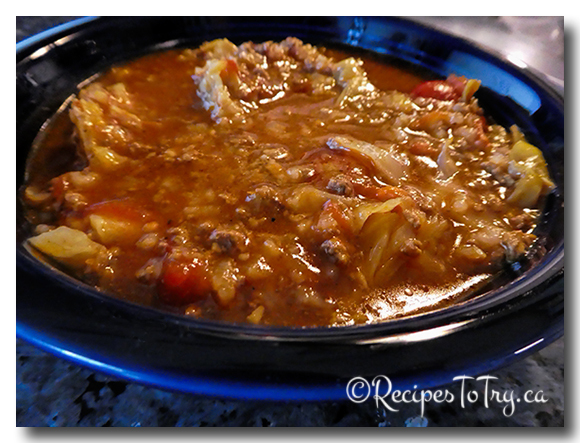 One of those meals that are great for those chilly cooler days. Add, onions, bell peppers, and carrots. Stir in garlic & ginger. Pour in chicken broth & water. 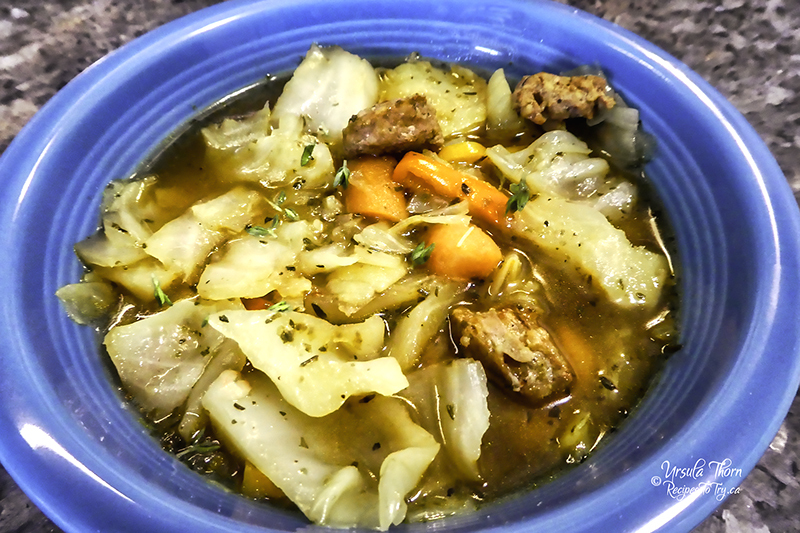 In a Dutch oven or soup kettle, sauté Sausage, cabbage, onion and garlic in oil for 5 minutes or until tender. Combine the broth, vinegar, and brown sugar; add to cabbage mixture. Stir in remaining ingredients. Bring to a boil. 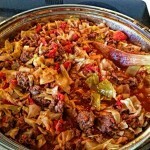 Reduce heat; cover and simmer for 60-70 minutes or until vegetables are tender. *Sazon is like the magic spice blend in many of my Latin dishes. It's commonly found in the supermarket in small envelopes that you add to stews, beans, rice, etc. It gives yellow rice that yellow color and makes anything taste good! Goya is the most popular brand or it is very easy to make your own Sazon seasoning mix. Substitute Turkey or Chicken sausage for the Italian Sausage to further reduce the calories. 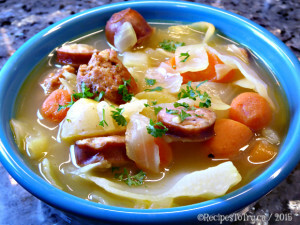 This is a tasty and wonderful one pot meal. A classic Irish dish to enjoy in a new way. 2 chicken bouillon cubes or 2 tablespoons of dry chicken broth mix. In a large pot or Dutch oven, heat oil over medium low heat. Add leeks and sauté until soft, about 4-5 minutes; add garlic, carrots and yellow pepper and sauté about 2-3 minutes. Add corned beef, and seasoning pack if it came with the corned beef, bay leaves, parsley and water and chicken bouillon or dry broth mix; cover and bring to a boil. Simmer covered on low heat for 3 hours, until the meat becomes tender. Remove the corned beef, set it on a cutting board and shred with a fork. Return it to the pot then add the cabbage, taste for salt and pepper and adjust as needed. 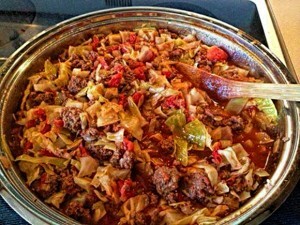 Cook until the cabbage are tender, about 45 more minutes. Take off heat and add the fish sauce*. The fish sauce will not make it taste fishy, it will however add depth to the broth making it even tastier. Sautéed onions and garlic provided a savory foundation, and ground ginger, cinnamon, and nutmeg adds a warm spice flavor to the sauce. Adjust oven rack to middle position and heat oven to 375 degrees. 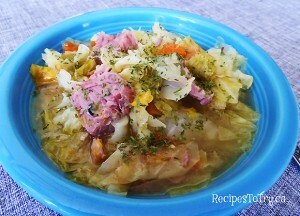 Place cabbage in large bowl, wrap tightly with plastic, and microwave until outer leaves of cabbage are pliable and translucent, 3 to 6 minutes. Using tongs, carefully remove wilted outer leaves; set aside. Replace plastic and repeat until you have 15 to 17 large, intact leaves. Heat oil in Dutch oven over medium-high heat until shimmering. Cook onion until golden, about 5 minutes. Add garlic, ginger, cinnamon, and nutmeg and cook until fragrant, about 30 seconds. Transfer half of onion mixture to small bowl and reserve. Off heat, stir tomato sauce, sugar, vinegar, ½ teaspoon salt, and ¼ teaspoon pepper into pot with remaining onion mixture until sugar dissolves. Pulse bread and milk in food processor to smooth paste. Add reserved onion mixture, beef, bratwurst, ½ teaspoon salt, and ¼ teaspoon pepper and pulse until well combined, about ten 1-second pulses. Trim tough ribs from cabbage leaves (see related Step by Step), roll 2 heaping tablespoons of meat mixture into each leaf, and arrange rolls, seam-side down, in 13- by 9-inch baking dish. 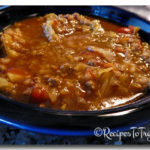 Pour sauce over cabbage rolls, cover with foil, and bake until sauce is bubbling and rolls are heated through, about 45 minutes. 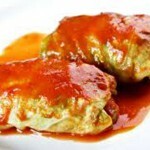 Remove foil and bake, uncovered, until sauce is slightly thickened and cabbage is tender, about 15 minutes. Serve. 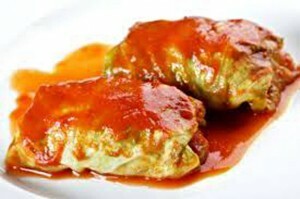 If the tops of the cabbage rolls appear dry after the foil is removed in step 4, spoon some of the sauce over them before returning to the oven. You can substitute ½ cup Panko crumbs for the sandwich bread just mix into the milk to form the paste. Also you can instead of using a food processor just mix crumbs, onions, beef, and bradwurst by hand. 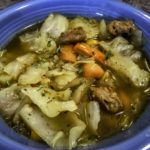 One of the keys to keeping cabbage rolls intact is to roll them as tightly as possible—which can be a challenge with tough, fibrous cabbage leaves. Here's how we solved the problem. 1. Remove the thick rib from the base of the cabbage leaves by cutting along both sides of the rib to form a narrow triangle. Continue cutting up the center about 1 inch above the triangle. 2. Overlap the cut ends of the cabbage to prevent any filling from spilling out. 3. Place 2 tablespoons of the filling ½ inch from the bottom of the leaf where the cut ends overlap. Fold the bottom of the leaf over the filling and fold in the sides. Roll the leaf tightly around the filling to create a tidy roll. Have you ever tried a roasted beet? It's a beautiful thing, and not just the color I'm talking about here, oh that flavor. And cabbage? Delicious! 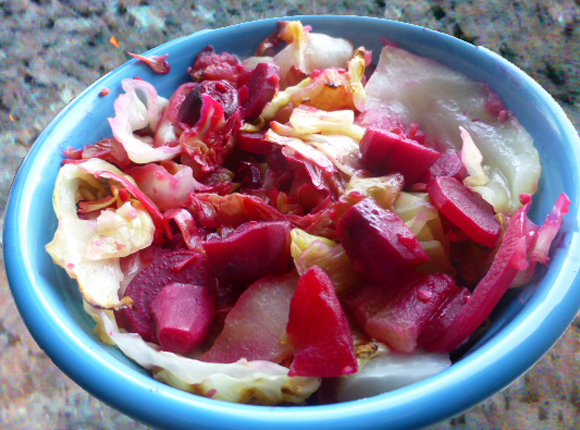 Add beets, cabbage, apple, salt, oil and garlic to roasting pan. To make in normal oven Preheat oven to 375 and roast for 50 minutes. Comfort food at its best. This dish follows a basic, unofficial food tenet that everything tastes better with bacon. Source: The Washington Post, December 3, 2008 Adapted from "The Diabetic Chef's Year-Round Cookbook," by Chris Smith (American Diabetes Association, 2008). Bring a large pot of salted water to a boil over high heat (for the noodles). Meanwhile, cut the bacon crosswise into thin strips. Cut the onion in half, then into very thin half-moons (at least 1 cup). Mince the garlic (to yield 2 tablespoons). 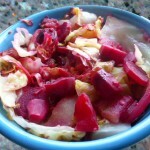 Core the cabbage; discard the core and any tough or worn outer leaves, then cut the cabbage crosswise into thin slices. Place the bacon pieces in a large, heavy-bottomed pot (such as a Dutch oven) over medium heat. Cook for 5 minutes, stirring once the fat has started to render and the bacon has begun to crisp. Add the onions and garlic; cook, stirring occasionally, for 8 to 10 minutes, until they have softened and begun to pick up some color. Season with the pepper. Add the noodles to the pot of boiling water; cook according to package directions. 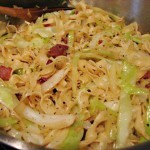 Add the cabbage to the pot with the bacon-onion mixture. 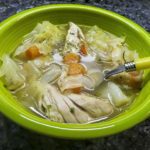 Cook, stirring frequently, for 5 minutes, until the cabbage has wilted and picked up some color, then add the chicken broth and cook, stirring occasionally, for 3 to 5 minutes. Add the salt and mix well. 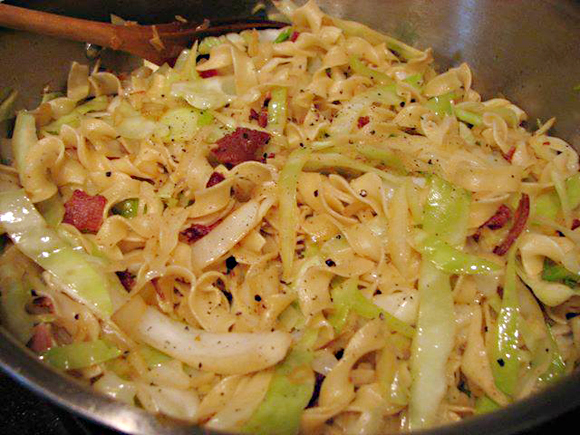 Drain the noodles in a colander, then add them to the pot; mix well to incorporate. Taste and adjust the seasoning as necessary. Sprinkle the parsley over the mixture and toss lightly to combine. Divide among individual wide shallow bowls and serve hot. 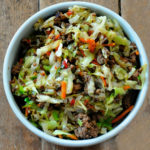 The cabbage-noodle combo is simple and comforting on its own but could easily receive a helping of cubes of leftover pork or shreds of rotisserie chicken. Serve with sautéed apples or pears.